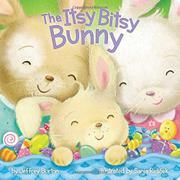 An Easter-themed board-book parody of the traditional nursery rhyme. Unfortunately, this effort is just as sugary and uninspired as The Itsy Bitsy Snowman, offered by the same pair in 2015. A cheerful white bunny hops through a pastel world to distribute candy and treats for Easter but spills his baskets. A hedgehog, fox, mouse, and various birds come to the bunny’s rescue, retrieving the candy, helping to devise a distribution plan, and hiding the eggs. Then magically, they all fly off in a hot air balloon as the little animals in the village emerge to find the treats. Without any apparent purpose, the type changes color to highlight some words. For very young children every word is new, so highlighting “tiny tail” or “friends” makes no sense. Although the text is meant to be sung, the words don't quite fit the rhythm of the original song. Moreover, there are not clear motions to accompany the text; without the fingerplay movements, this book has none of the satisfying verve of the traditional version.